Suppliers, especially small businesses, may not know where to start to sell their goods or services to the University. That's where our central Procurement Services Team comes in. Our Procurement Service sits within our Finance Department and focuses on corporate supply chain strategies, best practice and knowledge sharing while leaving individual departments and faculties to place orders and make tactical procurement decisions. LSBU's Procurement Services Strategic Plan sets out how the University's Procurement Services will achieve its vision of becoming a recognised centre of excellence and a visible contributor to LSBU's success. The strategic plan outlines how procurement will play its part in delivery the University's Corporate Strategy, focusing on 3 priority outcomes: embed student needs and values; empower staff; and be agile, innovative, efficient and commercial. The Procurement Services Team have implemented a category management structure, where spend categories are supported by dedicated procurement professionals. Category Managers work with Departments and Schools to develop the category strategies and deliver improvements to enhance value for money, and the overall success of the University. LSBU has a zero tolerance approach to bribery and corruption. Procurement is involved in various initiatives to help prevent Fraud – both internally to the University and to the profession in general. The Head of Procurement represents Education on a British Standards Institution (BSI) committee to develop guidance for Procurement Fraud, and sits on the Higher Education anti-fraud working group. The University is committed to the provision of equality for all, valuing diversity across all the dimensions of difference. Please view our Equality, Diversity and Inclusion Policy (PDF File 257 KB) to find out more about the arrangements we have in place to ensure all who study and work here do so free of discrimination. This requirement for treating everyone equally expands to those we do business with. This statement (PDF File 59 KB) sets out the steps LSBU is taking with the aim that slavery and human trafficking are not taking place within its supply chain or business. LSBU’s Living Wage commitment (accredited by the Living Wage Foundation) ensures everyone working at LSBU, regardless of whether they are permanent employees or contracted services, receive a minimum hourly wage of £9.75 - the current London Living Wage - significantly higher than the national minimum wage of £8.45 (for people aged 25 and over). Find out more about our Living Wage commitment. 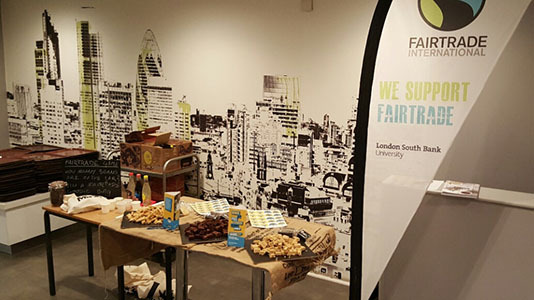 LSBU is Fairtrade certified. Fairtrade is about better prices, decent working conditions and fair terms of trade for farmers and workers. Products certified with a Fairtrade Mark mean that, for example, the Fairtrade ingredients in the product have been produced by small-scale farmer organisations or plantations that meet Fairtrade social, economic and environmental standards and the producer is guaranteed a better price. LSBU is Fairtrade certified. The Sustainability Team will be promoting Fairtrade produce at the annual Welcome Week Fair, and works closely with our on-site catering and hospitality partner, Elior, to promote Fairtrade produce year-round on our sites. All ethical supply chain audits are listed on the Sedex website. LSBU has joined a growing number of universities in the UK that are working to ensure the electronics they purchase are free from sweatshop labour. A total of 10 UK universities have now affiliated to Electronics Watch, an independent labour monitoring organisation that assists institutions in the public sector to support fair pay and decent working conditions for those who manufacture the goods they buy. Affiliation to Electronics Watch enables major public sector bodies to use their market influence to drive change in their supply chains. Through affiliating, institutions commit to writing basic standards of human rights into their contracts with ICT brands – standards which are then monitored for compliance by Electronics Watch, who work with democratic trade unions and civil society organisations in the factory locations to assess working conditions. By joining Electronics Watch LSBU joins two other London universities – Kingston University and the University of Westminster – who are taking action on sweatshops in the global electronics industry. These affiliations come off the back of an increasingly active and visible student campaign, Sweatshop Free, run by student campaigning organisation People and Planet. Students at Oxford University, Sheffield University and University of Kent among others are continuing to lobby decision makers at their institutions to take action on sweatshops by affiliating to Electronics Watch. 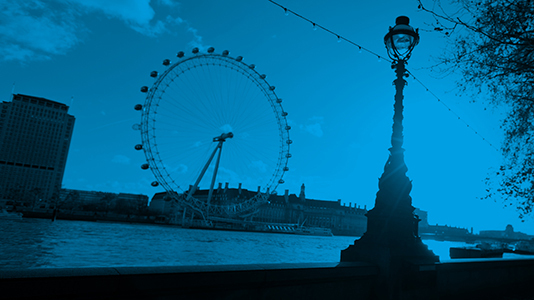 LSBU is a member of the London Universities Purchasing Consortium (LUPC). LUPC is a not-for-profit professional buying organisation owned by its members and operated for its members. Penny Green, LSBU’s Head of Procurement Services, is a member of LUPC’s Executive Committee which helps to set the consortium’s operational priorities and decides on sourcing strategies. Through LUPC’s collaborative framework agreements – all of which are compliant with EU public procurement regulations – its Members purchase a wide range of products and services, e.g. ICT equipment. In 2014, LUPC was one of only 25 founding members of Electronics Watch, a European public procurement campaign for labour rights in the global electronics industry. Therefore, LSBU is able to stay abreast of good practice in the ICT supply chain debate. In December 2015, LSBU attended a one-day Socially Responsible Procurement of Electronic Goods Symposium (external PDF) hosted jointly by LUPC, The University of Greenwich and Electronics Watch. The aim of the workshop was to provide a forum for in-depth discussion of current supply chain monitoring practices regarding electronics and the challenges to make them an effective tool for workers with the end goal of improving these worker’s conditions. LSBU is affiliated to Electronics Watch, an independent labour monitoring organisation that assists institutions in the public sector to support fair pay and decent working conditions for those who manufacture the goods they buy. The Estates and Academic Environment (EAE) Directorate and the ICT Department represent two key areas of spend for LSBU. Therefore, the LSBU Procurement Services Department work closely with colleagues in these two functions to ensure sustainability thinking is embedded where practicable in purchasing decisions. The Head of Procurement Services is a member of the University’s Sustainability Steering Group and is active within the sector, including being a member of the London Universities Purchasing Consortia (LUPC) Executive Committee. All of the senior managers in the LSBU Procurement Team have achieved Member level status at the Chartered Institute of Purchasing and Supply (CIPS). As a fully qualified member of CIPS (MCIPS) each manager has achieved an internationally recognised award which represents the global standard within the profession for a procurement and supply chain professional. LSBU is using the CIPS Sustainability Index, developed to assist procurement professionals create a consistent measurement process of sustainability credentials of the organisations they buy from. In June 2016, LSBU requested CIPS to complete a desktop review of LSBU’s supplier database, around 1300 suppliers, to check the extent of these that already appeared on CIPS Sustainability Index and following this, an action plan will be developed. LSBU is already operating to some of the Level 5 requirements of the Sustainable Procurement Flexible Framework issued by The Department for Environment, Food and Rural Affairs (DEFRA). The Flexible Framework is a widely used self-assessment mechanism developed by the business-led Sustainable Procurement Task Force, which allows organisations to measure and monitor their progress on sustainable procurement over a period of time. At present, LSBU is seeking to consolidate its activity in this space and has an action plan to reach Level 4. LSBU asks a number of key environmental, sustainability and corporate responsibility themed questions in our standard Supplier Assessment Questionnaire – for example, for the supplier to respond to the requirements in the UK Modern Slavery Act 2015, supply a copy of an environmental, sustainability or corporate responsibility policy and provide an outline how it complies with appropriate health and safety legislation. The Procurement Team - supported by the Sustainability Team - are now working with NET Positive, an organisation that helps LSBU (as well as other HEI’s) to engage with its supplier base regarding sustainability-related risks and opportunities in the supply chain. In November 2016, LSBU’s Sustainability Manger James Whittingham joined LUPC’s Responsible Procurement Advisory Group, a panel of procurement managers, sustainability managers and students drawn from the LUPC Membership. The group prepared a policy and strategy which has been designed to support LUPC Members in achieving their responsible procurement aims and was recently endorsed by the LUPC Board and Executive Committee. Find out more about sustainability initiatives at LSBU. Procurement Services aim to join up the University's supply base with wider initiatives to increase the employability of our students. If you are interested in helping to improve the employability of our students, through providing lectures, placement opportunities, CV tips etc., contact Procurement at procurement@lsbu.ac.uk or call 020 7815 6017.